10 Burnt To Death In Fuel Tanker Fire In Lokoja. 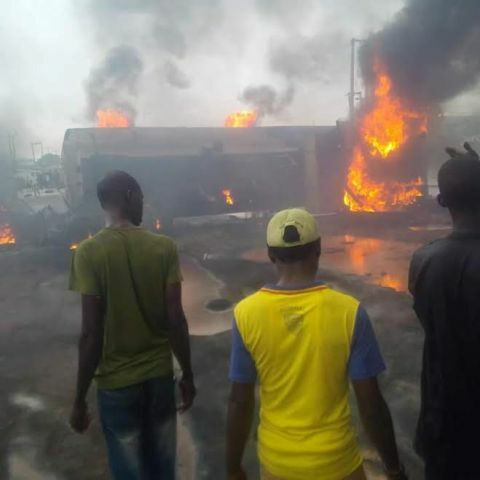 At least 10 people have been burnt to death while six others sustained serious injuries when a petrol tanker went up in flames in Felele area of Lokoja on Friday. The Sector Commander of the Federal Road Safety Corps in Kogi State, Mr Segun Martins, said most of the victims were passengers travelling in an 18-seater commercial bus. According to NAN, also affected were one commercial tricycle operator, the driver and motor-boy of the fuel tanker. He said the death toll might rise as some of those who sustained injuries were in critical situation. Martins said the dead and injured victims were moved to various hospitals in Lokoja. Eye witnesses said that the accident was due to a head-on collision between the bus, coming from Abuja and the tanker coming from the opposite direction. They said that the impact of the collision ignited the fire which spread to other vehicles while the entire area was covered by smoke for many hours. Men of the state Fire Service Department, who arrived the scene at about 2:20 pm, could not to really help due to lack of water in their vehicles. The accident led to disruption in vehicular movement on the ever busy Okene -Lokoja -Abuja Road but FRSC officials, police and sympathizers were seen trying to open the road. Gossip Mail: 10 Burnt To Death In Fuel Tanker Fire In Lokoja.